Sewing for the holidays should be fun, and not add stress to an already often hectic season. We’d like to make it even easier for you by clueing you in on five super simple sewing projects that can be made in an afternoon, easy enough to replicate for any number of gifts or decor for the season. They’ll be so perfect and original, no one will know they didn’t come straight from the hands of elves, delivered down the chimney from Santa himself. 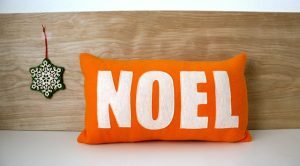 We love the endless possibilities with applique, and this Noel pillow from Dana Made It is just one example of how you can switch out your current pillows for a set to match the season. If you don’t feel comfortable drawing and cutting out the letters yourself, choose your favorite font off the computer and spell out Noel in the size you’d like — we think one letter per sheet should do the trick. Cut out the letter from the paper once it’s printed, and use it as an easy template for tracing and cutting out your fabric. A rotary cutter and ruler might help if your fabric isn’t stiff enough to be held firmly in your hand while cutting and it’s sure to give you the straightest edge. Make your cards extra special with a touch of fabric, a simple way to show off your love for sewing! This Holiday Card project from Smashed Peas and Carrots is perfect for scraps, and you’ll most likely have just what you need in your fabric stash already. 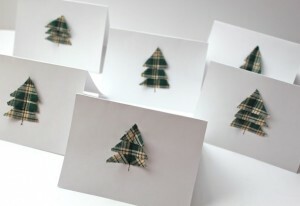 Simply line up your cut triangles and stitch a quick line up the middle to hold in place — voila, you have a tree! Stuffed animals are always a win, especially a cute little creature that reminds us of the best parts of the chilly weather. 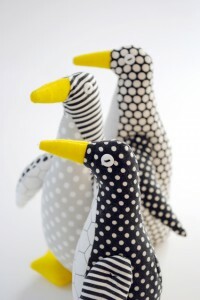 Bring a waddling penguin under the tree with a simple sewn composition with this Penguin project from The Purl Bee, and have some fun mixing & matching black and white prints for the penguin’s body. Weigh down the bottoms with dry beans before closing up the body for topple-proof display. What a cute little gift for the holidays. 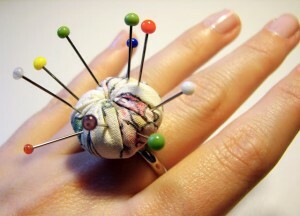 This fun ring would be perfect for the seamstress in your life! You can find all of the instructions to make this super creative gift at Laura’s blog, My Little Nook. Decorating for the holidays is something we take great joy in, especially when we know we’ve crafted the decorations ourself. Get the whole family involved in this sewing project from Betz White that requires very little skill but yields expert results. A thick felt makes it a quick cut and sew, with hemming and frayed edges no concern at all. 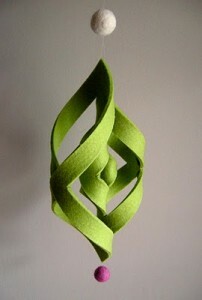 Hang it from your tree or in a doorway, we just love how these ornaments look when they spin! Needle felted balls add fun to this ornament; we can see pompoms here, too, for a pop of color and texture. Get the Felt Ogee Ornament Tutorial here. Next Next post: Sock Monkeys… and MORE Sock Monkeys!